Beyonce performing her full album at the 2014 VMA(Video Music Awards) has been talked about in the rumor mill for days. 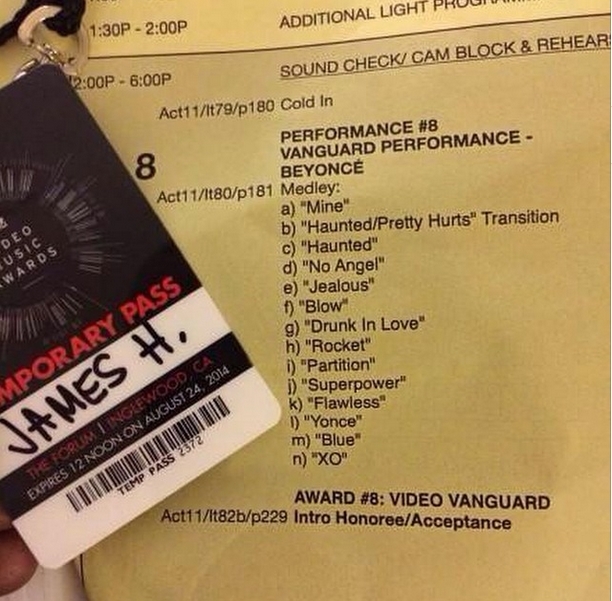 Well if this performance sheet is anything to go by then we should be expecting Bey on stage. According to the line up, Performance 8 which is a Vanguard performance features Beyonce. The performance will start with Medley followed by the following songs; Mine, Haunted, No Angel, Jealous, Blow, Drunk in Love, Rocket, Partition, Superpower, Flawless, Yonce, Blue, and XO. The video Vanguard award is to be presented afterwards. If she really is performing tonight, we look forward to seeing it and of course I will be bringing you clips and videos from the 2014 VMA as it happens. I watched it, just when I was getting into a song, she started a new one. I hate medleys. But she killed it. Her set was absolutely epic! !